Cable rescue carriages are used to move along wire cables. the directive (EU) 2016/424 relating to "cableway installations" as well as the EN standard 1909 “Recovery and evacuation”. The IMMOOS rescue carriage is a self-driven cable carriage with automatic centrifugal brake, dead-man brake and hand brake. Usable on stranded cables with up to 105% cable slope. The IMMOOS rescue carriage is a self-driven cable carriage with dead-man brake and hand brake. Usable on stranded cables with up to 50% cable slope. Less wear thanks to a second driving roller. 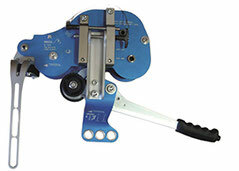 Optimally suited for steep, long rope sections with small rope diameters. 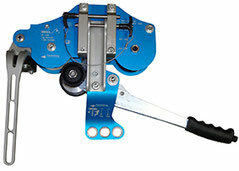 The manual drive can be used optionally for the SS1 in order to cross short, flat cable sections by hand. 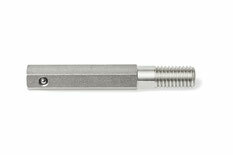 The crank can be inserted on the left or right. Optionally, a crank can also be inserted on each side. To cross longer flat or slightly upward-sloping cable stretches effortlessly, the carriage can be driven with a battery-operated drill. 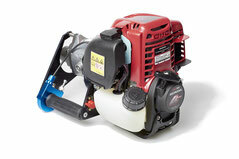 A special insert for the battery-operated drill is available for this. Battery driven hand drill for moving the SS1. Including case, 2 batteries and recharger. With the 4-cycle motor drive, cable sections with a slope of up to about 20° can be ridden uphill. The motor is fastened to the SS1 by means of a coupling plate. The conversion kit is included. 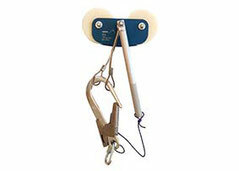 Two-roller rescue carriage with wire cables as hangers, special roller rocker and fixed grip. Usable for all wire cables of up to 60 mm diameter. 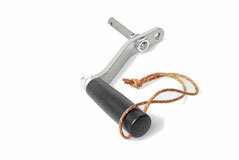 The running gear includes the aluminium safety hook ASH 60 and a delta screw link (not included in the price). 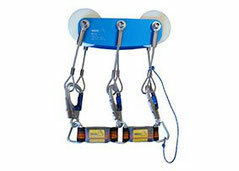 The two-roller rescue carriage type TB can move up to 3 persons, usable for all wire cables up to 60 mm diameter. The running gear includes the attack carabiners, delta screw links and energy absorbers.